What a wonderful way to wrap a gift! So elegant! Thanks for the chance to win! Congratulations Clare, you will soon be contacted with details on how to claim your prize. Make sure you head over to the design team blog to see if you've won the GRAND PRIZE. I have a tiny sneak peek of my design team project to share today as well. The entire project will be revealed on Thursday, November 15 over at The Robin's Nest. Make sure to go check it out! Thank you to everyone who participated in the blog hop!! Home For the Holidays BLOG HOP! The Robin's Nest and Helmar have teamed up for a BLOG HOP! As soon as I heard "holidays" I immediately thought of gift wrapping/packaging...because who doesn't like presents? I wrapped up this little gift box using supplies from The Robin's Nest and adhesive from Helmar. The paper accordion was made with white snow glitter cardstock with added gold glitter to the edges. I made the white yoyo flower with sheer white material and layered it over a white flower from the white flowers pack. Gold bow and gold ribbon came from the pretties ribbon pack and the gold dew drop can be found here. The wood snowflake, wooden button, and white tulle were just scrap supplies I had lying around. All embellishments were attached with Helmar quick-dry adhesive. Did I mention the giveaway?? If you leave a comment on this post, you have a chance to win a $10 giftcard to The Robin's Nest store! Free stuff right? I know! I will post the giveaway winner on November 11. There is also a chance to win the grand prize $20 RN gift card over here. Thank you for stopping by my blog today...and good luck! I decided to take my colour inspiration this week from the parisian mini dew drops. The aqua, pearl, and yellow is such a sweet combo! A very girly, VERY ruffly page with a picture of my sister and me on a dinner date. The ruffles were made using white streamers (crepe paper). With an 8.5x11" piece of plain cardstock as my base, I sewed simple ruffles across the entire page using my sewing machine. I wasn't trying to make them perfect or straight so I just sewed really quickly and I love how it turned out. Behind the photo I layered a square of honeycomb linen cardstock (side B), tissue paper, a snippet of silver glitter chipboard, a snippet of glitter blue robin cardstock (side B), a circle of classified cardstock that I spray misted yellow, a doily, and a large banner strip of glitter white swirl cardstock. I love how thick the Robin's Nest papers are; it makes them so easy to mist, distress, and layer! The classified cardstock is so neutral and acts as a great base for misting. Detailed shot of the fabulous parisian and fairy dust dew drops. 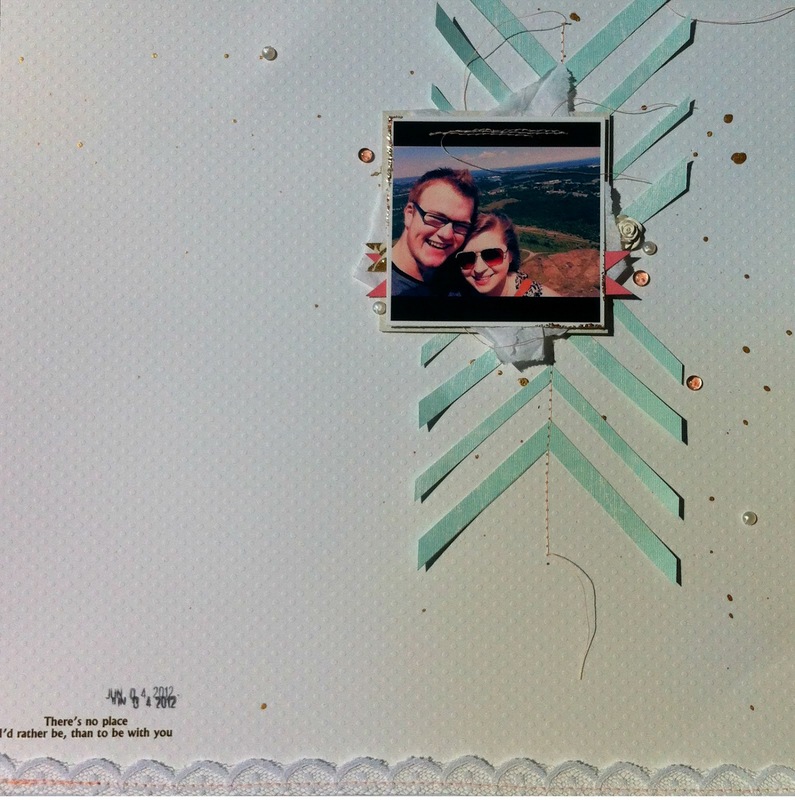 This is a layout about my sister and I that I made with some beautiful Robin's Nest products. I started off with a sheet of Ancient Map Cardstock as my base. I splattered a bit of white mist on the right side of the page before I started layering. I layered some light beige packing paper, 2 types of vintage lace, a piece of brown herringbone cardstock, a glassine bag with a manila tag tucked inside, a sheet of paper from a vintage Japanese book, a rub on from the Time Rubon sheet, some gold glitter leaves, and a white feather. A closeup of the embellishments on the left side of the photo. Men's Dew drops and in love in Italy dew drops are scattered throughout the layout. I stapled a little snippet of glitter gold on creme swirl cardstock directly onto the photo to offset the title. I made the title with the gold glitter alphabets which I then sewed over. The hidden journaling inside the glassine envelope completes the title. In the journaling I listed a few of the things that my sister and I are. (sisters, friends, etc.) I tied a bow using some ribbon from the Blessed Pinks Ribbon Pack onto the manila tag so that it would be easier to pull out. There's also a bit of grey airmail washi tape and smoke cardstock layered at the top of the layout. Thanks for visiting the blog today!! As soon as I saw the "you've captured my heart" ribbon in the Dazzling Pretties Ribbon Pack, I knew I had to use it on a card. It's so versatile! You can mist it, cut it, sew it etc. On my card I chose to leave it's natural colour but snipped it into 2 pieces. I diecut a "speech bubble" sort of shape out of the discovery girl glitter cardstock and layered it over some white tissue paper and white thread. Some mist splatters, in love in Italy dew drops, hand drawn hearts, and gold airmail washi tape give it a bit more detail. I added a bit of glitter to the edges of the diecut shape, sewed through the ribbon with pink thread/my sewing machine, and added a button to finish it off. The button was just a plain wooden button which I embossed with gold embossing powder then sewed on with simple white thread. My post is also up over at the Chattering Robins blog today! Hi all, I'm back with my second blog post for The Robin's Nest! For this project I laid out all of my Robin's Nest supplies on my desk and decided to choose my FAVOURITE thing to work with this week. The Glitter Gold on Creme Cardstock won out! It's no secret that I have a gold glitter obsession, so it's really not surprising. ;) This cardstock is truly beautiful...it's a nice heavy weight to work with and the glitter is so vibrant. Check out the rest of the gorgeous colour options here. 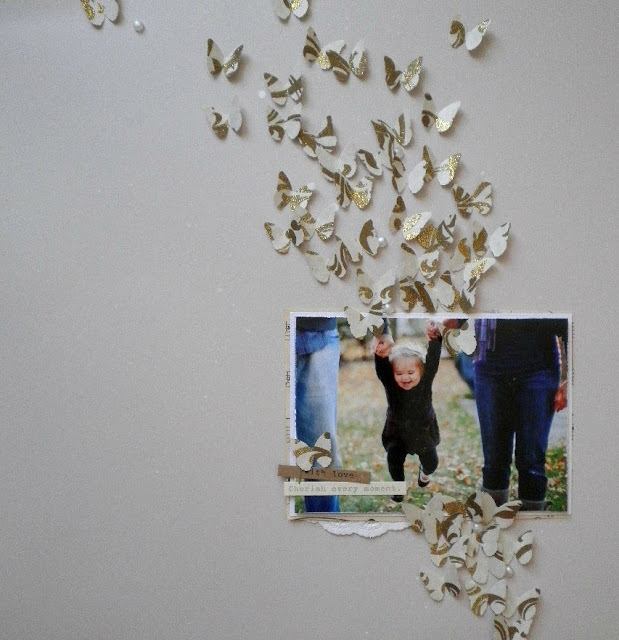 I used a picture of my sweet cousin as my focal point. So adorable! I first sprayed my background cardstock with white mist to add texture. It's kind of hard to see in the pictures, but it's there! To create the cascade of butterflies I simply punched out a whole bunch of them from the glitter swirl cardstock, arranged them, the glued each one down with quick drying liquid adhesive. (I can't wait to do this with other shapes too! Circles, diamonds, stars, etc.) The weight of the glitter paper makes it so easy to add dimension by folding and layering! 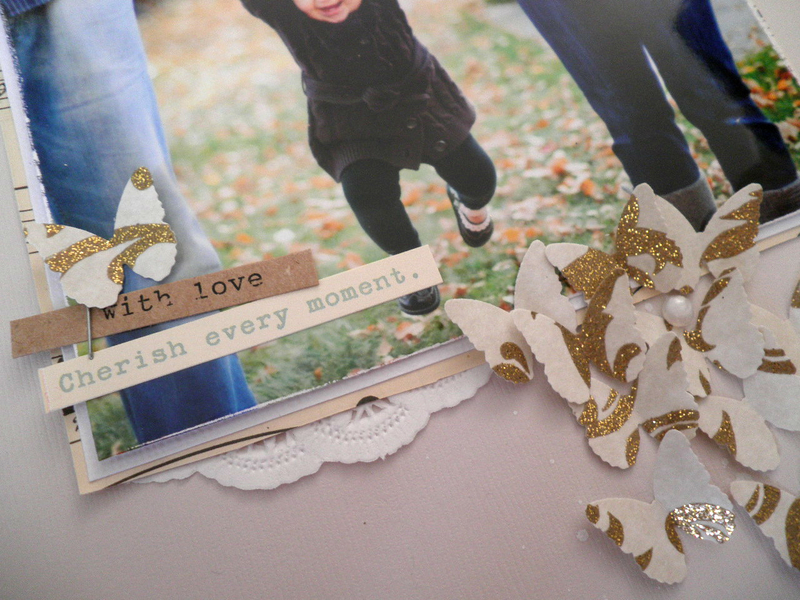 Once my glue dried I added In Love in Italy Mini Dew Drops throughout the butterfly shapes. I layered white cardstock, vintage sheet music, and the edge of a doily behind my photo. Make sure to go browse through the online store and check out the other gorgeous supplies available! My first post went up on the Robin's Nest Blog today! This week I made a scrapbook layout to share with you. My #1 scrapbooking technique is layering. No page is complete without a few layers! First, I started off with an Instagram picture. I added a bit of machine stitching to the top of the picture for some added texture then added a bit of gold glitter to the edges. Behind the the picture I layered some white tissue paper, (just generic dollar store stuff) 2 paper strips, and a piece of Robin's Nest smoke cardstock. The arrow paper pieces were made by cutting diagonal lines into a beautiful aqua piece of Robin's Nest paper. I added gold paint splatters to the cardstock background, a strip of vintage lace at the bottom of the page, and one of the Robin's Nest rubons in the bottom lefthand corner. I love LOVE dew drops! Where have they been all my life?? 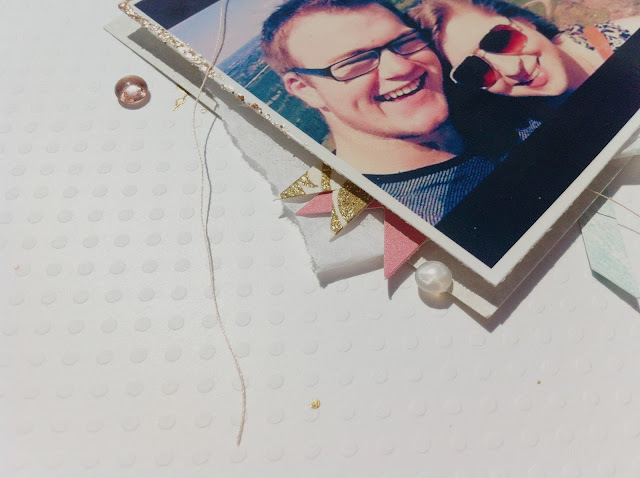 They are an amazing, versatile scrapbooking embellishment and I have been using them on EVERYTHING. Plus, the dew dew glue makes it so easy to apply them. I handmade the white flower using Sculpey clay. Close-up shot of the simple layers. I love that Robin's Nest offers so many papers that have glitter on them! I loved working with these products and can't wait to keep creating things to share with you! eighteen. 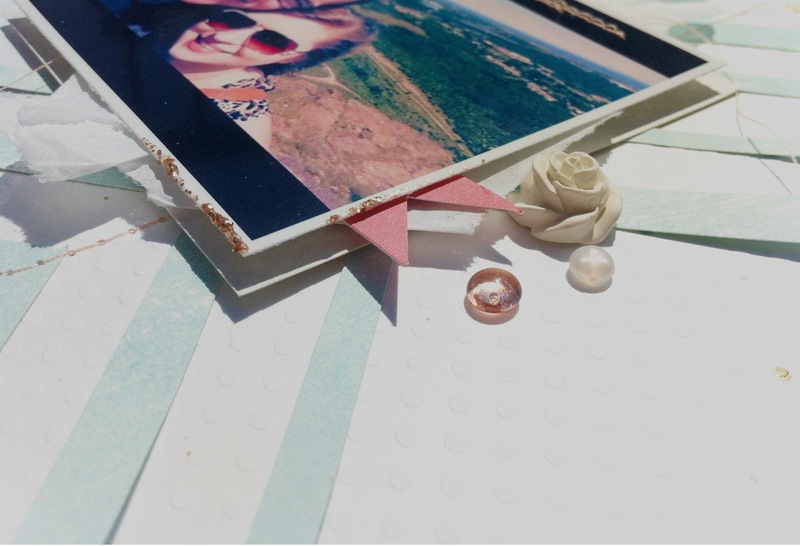 love scrapbooking and crafting. night owl. hate fruit in dessert (excluding bananas). high maintenance. creative. avid reader.. love to laugh. organized. a fan of anything crafty.